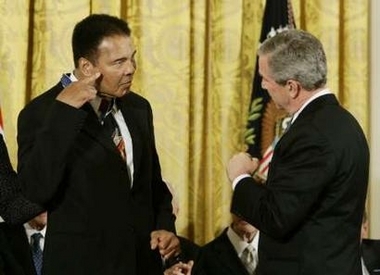 George W. Bush honored the boxer, Muhammad Ali, and 13 others with the Presidential Medal of Freedom, called "the nation's highest civilian award," on November 9 at the White House. The president praised Ali for his sports accomplishments and called him "The Greatest of All Time." Fine, but he then proceeded to laud Ali's character: "The real mystery, I guess, is how he stayed so pretty. It probably had to do with his beautiful soul. He was a fierce fighter and he's a man of peace. … Across the world, billions of people know Muhammad Ali as a brave, compassionate, and charming man, and the American people are proud to call Muhammad Ali one of our own." In this giddy, fawning statement, Mr. Bush did not, the Washington Post astringently noted, "mention Ali's very public opposition to the Vietnam War, which led the prizefighter to lose his boxing license for three years when he refused to serve in the Army." Worse, his refusal to fight was not because he was "a man of peace" but rather because his allegiance was to the stridently anti-American, anti-white organization known as the Nation of Islam, headed by the malign Elijah Muhammad. Forty years ago, Ali explained his draft evasion: "War is against the teachings of the Holy Koran. I'm not trying to dodge the draft. We are supposed to take part in no wars unless declared by Allah or The Messenger [i.e., Elijah Muhammad]. We don't take part in Christian wars or wars of any unbelievers." A draft evader, incidentally, is particularly ill-suited to receive the Medal of Freedom, which was created in 1945 to recognize "notable service" in World War II. The president also did not touch on Ali's religious side, but Mark Kram did in his 2001 book, Ghosts of Manila: The Fateful Blood Feud between Muhammad Ali and Joe Frazier: "Ali broke every tenet of real Muslim law, from whoring to being truant at Temple service; he was a religious fake who abdicated his personal worth to the Black Muslims for their expediency and draft evasion, [and was] therefore, counterfeit down to his socks." As he aged, Ali did become more devout, but in unfortunate directions. He declared himself against "the entire power structure" in America, which he declared was run by Zionists who "are really against the Islam religion." He became so radical a Muslim that the notorious Council on American-Islamic Relations, North America's most powerful Islamist group, also honored him with an award in June 2004. As its press release stated: "Ilyasah Shabazz, the daughter of Malcolm X, presented the first Malcolm X award to Muhammad Ali." Mr. Bush's praise for Ali's compassion, charm, and beautiful soul are horribly misplaced (as were large donations from General Electric and Ford to the hagiographic "Ali Center" that opened days later in Louisville, Ky.). Ali's unvarnished legacy is an exploitative personality, sordid career, vicious politics, and extremist religion. Bush, who appeared almost playful, fastened the heavy medal around Muhammad Ali's neck and whispered something in the heavyweight champion's ear. Then, as if to say "bring it on," the president put up his dukes in a mock challenge. Ali, 63, who has Parkinson's disease and moves slowly, looked the president in the eye—and, finger to head, did the "crazy" twirl for a couple of seconds. The room of about 200, including Cabinet secretaries, tittered with laughter. Ali, who was then escorted back to his chair, made the twirl again while sitting down. And the president looked visibly taken aback, laughing nervously. Was Ali making a political statement? Awarding of the Presidential Medal of Freedom to Muhammad Ali gratuitously celebrated a man profoundly opposed to Mr. Bush's own, his party's, and the country's principles. It represents, I submit, the nadir of his presidency. 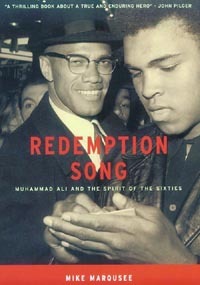 Dec. 1, 2005 update: I discuss this subject further at "Muhammad Ali's ‘Beautiful Soul'." Related Topics: African-American Muslims, Muslims in the United States, US politics | Daniel Pipes receive the latest by email: subscribe to the free mef mailing list This text may be reposted or forwarded so long as it is presented as an integral whole with complete and accurate information provided about its author, date, place of publication, and original URL.